Thank you to Kreg Jig and Buildsomething.com for sponsoring today’s post. 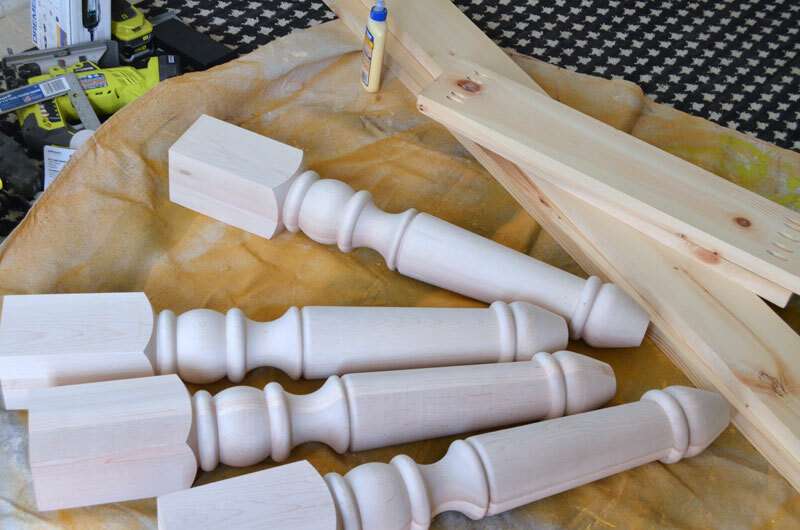 Also thanks to Osborne Wood Products for providing the table legs, and DecoArt for providing the color stain. All opinions and words here are my own. This post contains affiliate links. That means if you make purchase through one of the links, I make a small commission at no additional cost to you. Thank you for supporting Create & Babble. 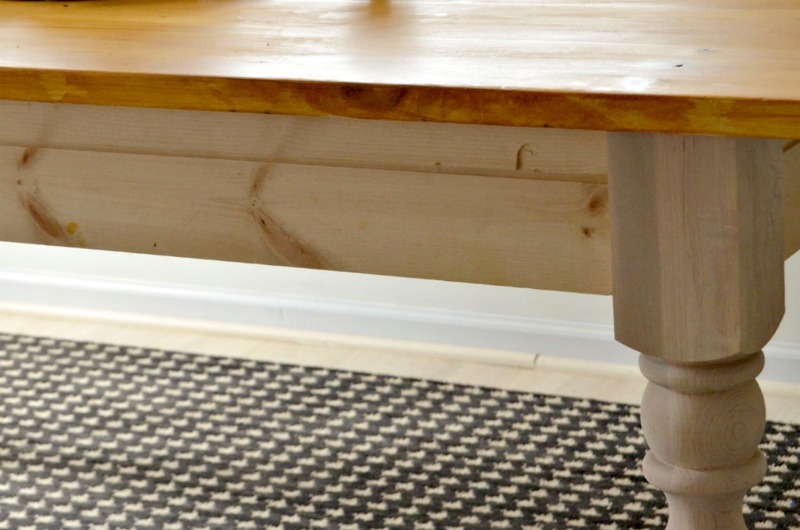 I needed to figure out how to build a farmhouse table that would work for my family room. Not only did I figure out a way to build a custom farmhouse table, I built it with just seven boards! Yes 7! I used seven 5/4 Select Pine boards from the Home Depot. 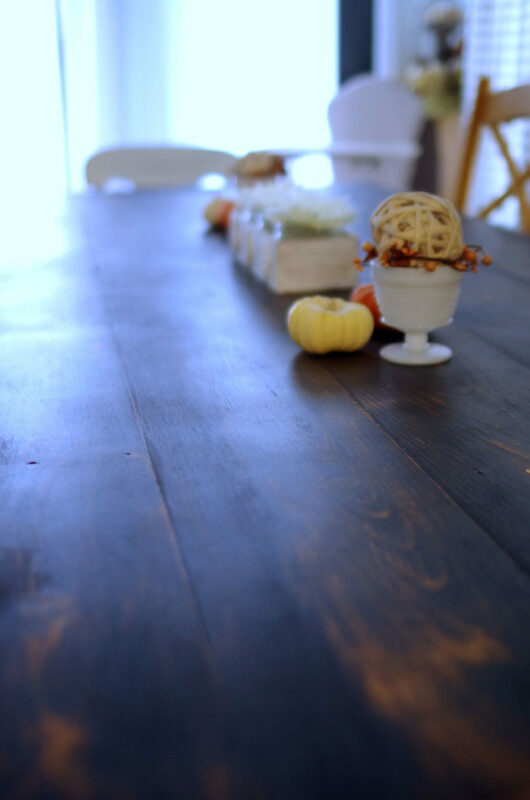 Those thick boards caught my eye and I knew they would be perfect to build a farmhouse table. And bonus: 7 boards would fit in my coupe! 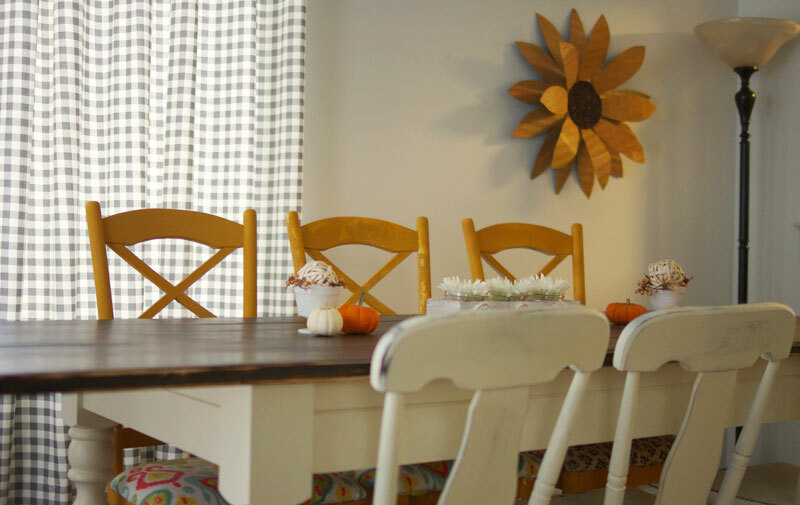 The need for a custom farmhouse table came about when we decided to use our family room as a family room. Not as a living room. Our kitchen is small – not really an eat-in kitchen. Especially not since I added the desk-to-island island. And we were treating our family room as a living room with no designated dining area – just a high-top table with two stools in one corner of the room. Which was fine for just Dan and me. But no bueno when family and friends came over. And since this room is multi-functional, we didn’t want the farmhouse table to be so big that it looked like it was overpowering the room. but we also wanted it large enough to seat everyone for Thanksgiving dinner! 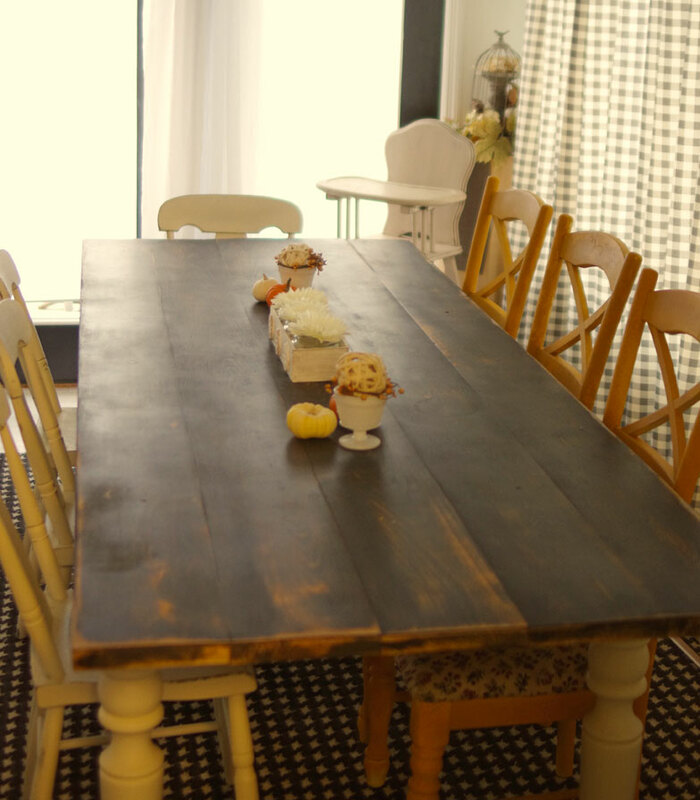 I wanted to build a farmhouse table that was long enough to accommodate 10 chairs, but not be too wide. A little more narrow than a standard size table. And it had to have thick, chunky legs. 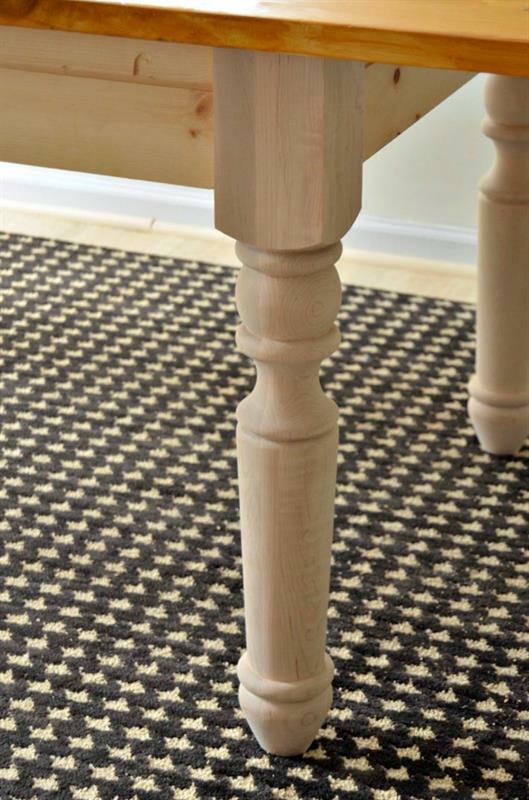 These 4″ Wide Portsmouth Dining Table Legs are perfect! That’s what’s so awesome about building your own furniture. It’s custom! You build to your specifications – not some industry standard! I could envision what I wanted my farmhouse table to look like. In addition to chunky, turned legs, it had to have a wide-planked top. And the finish. It had to be just right. 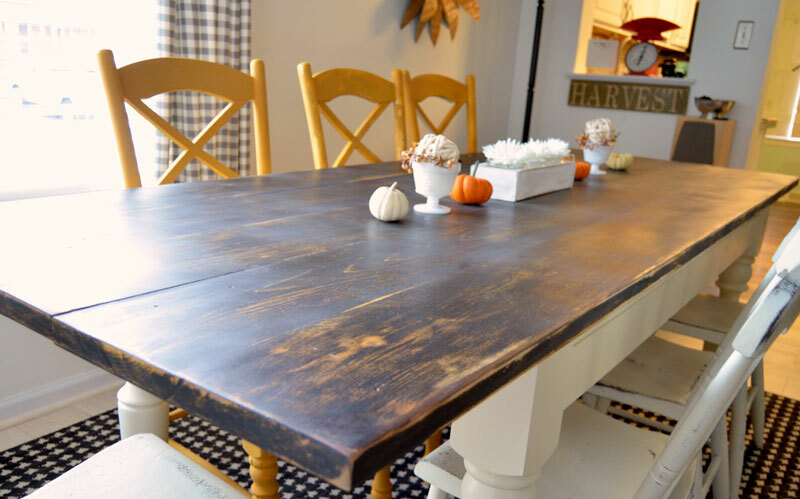 There are lots of white, distressed farmhouse tables out there. 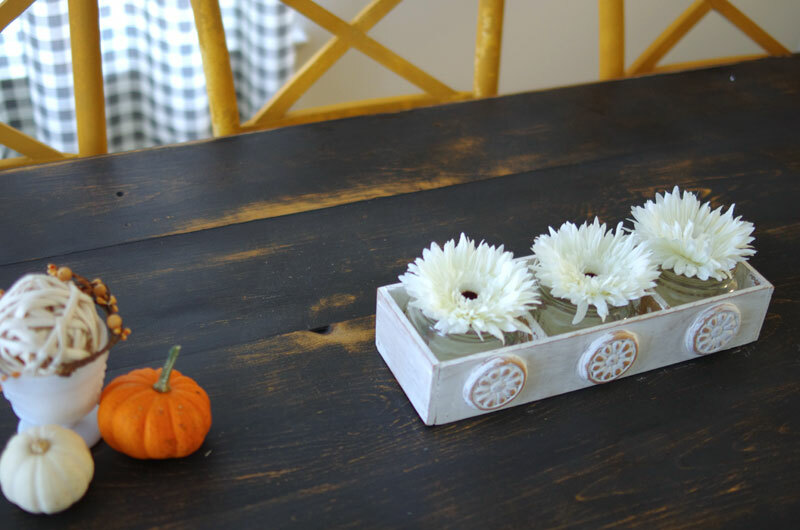 I love that look but I wanted my farmhouse table to be a little different. But what? I was leaning towards a dark table top. Distressed and dark. With a great color showing through the distressed areas. I wanted this table to look like it had been stored in a barn for decades. And then someone pulled it out and cleaned it up a little. What do you think? Did I achieve that look? I think I did. The plans and step-by-step directions for building this farmhouse table are available at Buildsomething.com. BuildSomething.com is Kreg’s new DIY project plan site. As I was building the table, I just kept thinking about the finish. What color? Paint? Stain? Both? I really took my time with this. I lived with the table for a while as you see it above: nothing on the base or legs. I had applied a couple of coats of Americana Decor Color Stain in Golden Honey to the top. I loved this look. But would I tire of it? Was I drawn to the pumpkin color only because it’s Fall? How would I like that color in the Spring or Summer??? These were all questions that I kept asking myself over and over. After all it’s a big piece of furniture! I kept going back to my original thought of a dark, distressed table top. And white(ish) legs. 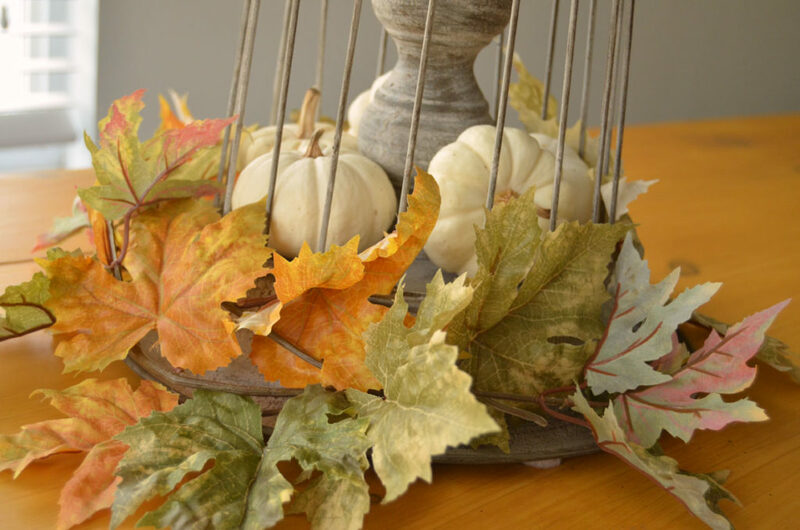 In the end I went with a dark milk paint (I used Miss Mustard Seek Milk Paint in Typewriter) over several layers of that wonderful pumpkin color of American Decor Color Stain in Golden Honey. The top was finished with a dark wax. As for those wonderful, chunky legs. I painted them with General Finishes Chalk Style Paint in French Vanilla. I used a clear wax to seal. Now I can’t wait for Thanksgiving! I’ll have room for the entire family! One more photo of that table top! 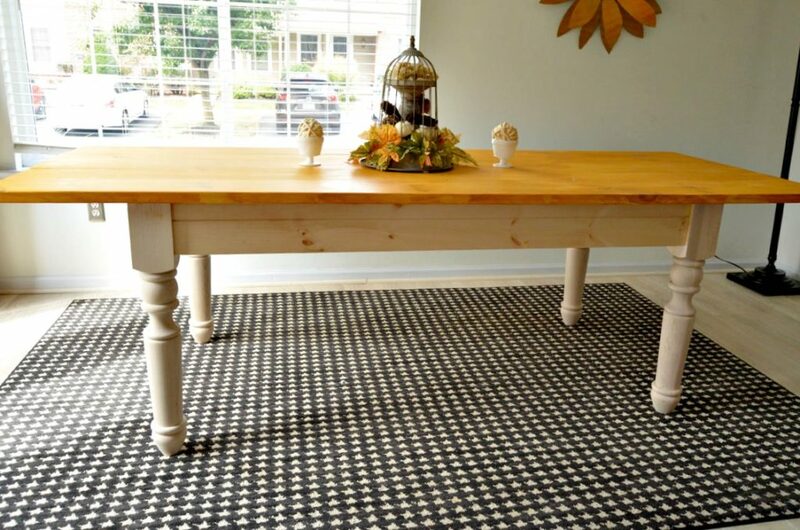 I love everything about your table – it’s the perfect size!! You did such a great job, Jeanie! I love the table! This is FANTASTIC!! I love the look, definitely pinning for the future! Dining table is beautiful, its color is harmonious with the room. However, I prefer the pale blue. Anyway, it was great. Love it! The color is beautiful!! I’m impressed – it’s BEAUTIFUL!! Love the finish. I love your table Jeanie! It’s perfectly perfect! 5/4 boards? I don’t think I knew about these at Home Depot. Does that mean they are over 1 inch thick? huh, what? Where? I’m about to start a project and this size would be perfect! Oh, those legs are beautiful! I met Osborne at Haven just last weekend and was so impressed with their pieces. 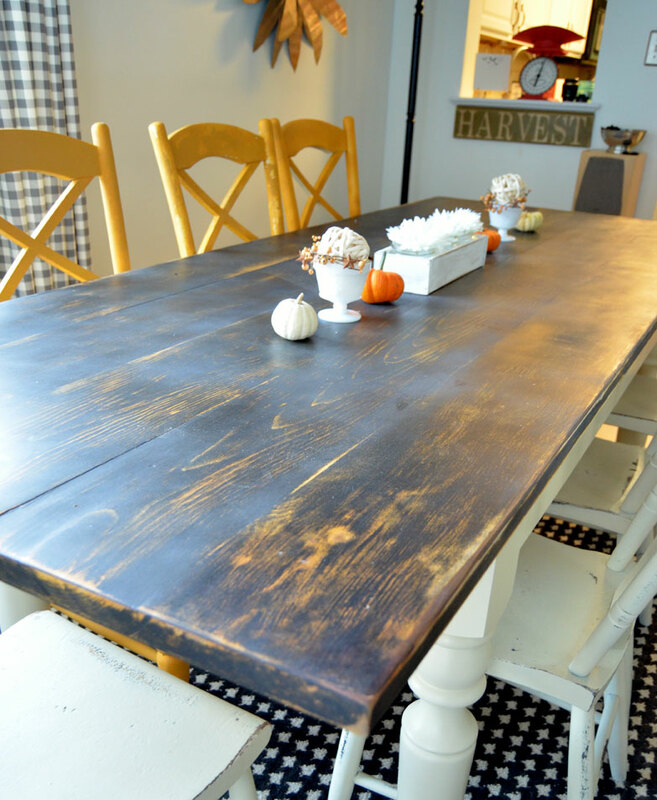 I want a farmhouse table now! 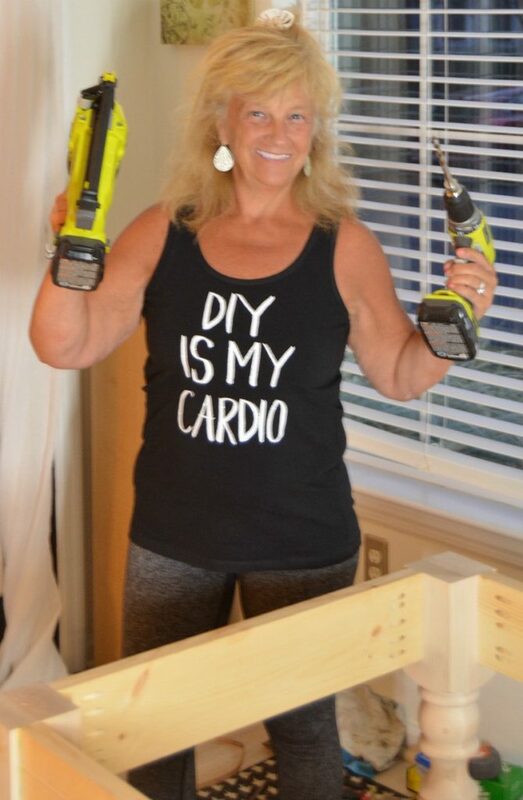 And I LOVE that shirt (DIY is my cardio), so cool! Love this table! Thanks for sharing on To Grandma’s House We Go! I’ll be featuring you next week! It turned out absolutely gorgeous! Love the dark stain. Thanks for sharing with SYC. I LOVE that shirt, so cool!